Why Should You Incorporate Pilates Into Your Workout Routine? The question can be answered as individually as each person’s needs are different. I spoke with a client this morning who told me that by adding Pilates into her workout schedule, it has enabled her to feel better. She is less tight, she overall has no aches & pains. Her back is feeling better. She is more flexible. She is seeing muscles develop that no matter what other kind of workout she has done, has never been able to get the “definition”. Just getting one of these many desired outcomes would make it worthwhile. But can Pilates really do ALL that? Yes! This is not a unique conversation or outcome. This has been told to me more times than I can count. I myself have had a complete change in my lifestyle because of Pilates. You see Pilates is more than a workout. 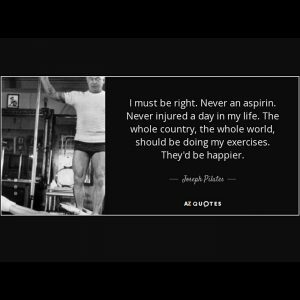 It is a discipline & as Joe’s quote states, everyone should be doing Pilates. So if you have not achieved the results you have put countless hours into, if you are not feeling less achy, if you are not getting stronger & more flexible than I highly recommend getting started on your Pilates practice! Joe Pilates was way ahead of his time.